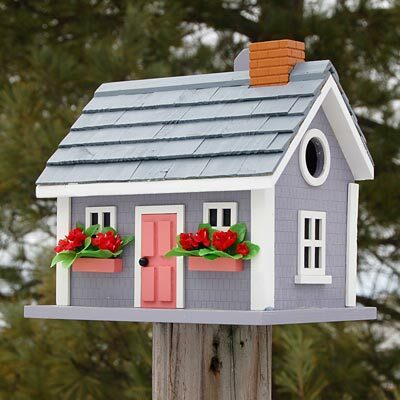 Enhance your backyard with an adorable songbird retreat by placing this Home Bazaar Grey Vineyard Cottage Bird House in it. Striking colors, remarkable detail, and a wooden frame make this home a fantastic addition to your bird garden. The grey tone of the body, roof, and bottom platform is sure to enhance your garden, while the pink door and window boxes lend exciting contrast to the piece. White trim around the faux door and windows, as well as on the corners of the house, bring a bright hint to it, and a pitched and shingled roof completes the charming look. A 1.25" diameter entry hole sits beneath the roof overhang on one side, enabling chickadees or wrens to use the shelter. Its generous, unpainted interior forms a safe haven for your feathered friends, and drainage holes on the base help the nest remain dry. Screening beneath the entry hole acts as a ladder, allowing fledglings to reach it when ready. Remove the back panel for nest checks or maintenance, and use the included hanging tab to place this home against a wall, tree, or post. Place a mounting plate (not included) on the base of the home to display it on a pole or post for more versatility. The bold colors and ornate design make this shelter a perfect addition to your garden, while the wooden construction ensures durability. Offer small birds a retreat with this Grey Vineyard Cottage Bird House. Note: Climate and the elements will weather this home and change its appearance over time; however, weathering will add to the item's natural charm without compromising its function. Should you want to preserve the finish (paint) of this house, you should cover it with several layers of a polyurethane product that is recommended for marine use (UV Rated) that will not turn the white paint yellow. You should expect that once left outside, the item will weather and require refinishing. Erva Post Mounted Squirrel Baffle, Galvanized, 23.25" dia.